Microbial contamination of groundwater could induce waterborne diseases such as hepatitis A, viral gastroenteritis, cholera, typhoid fever and giardiasis. Microbes being living organism, their transport in the groundwater is different than abiotic materials (Ginn et al., 2002). Physical processes such as advection, dispersion, straining, filtration, electrostatic and chemical process are responsible for microbial transport in groundwater (Ginn et al., 2002). Microbial transport has been found to be controlled by hydrogeological heterogeneity of subsurface sediments (AGU, 2001). Various factors such as adhesion processes, filtration effects, physiological state of the cells, porous medium characteristics, water flow rates and intrinsic mobility of the cells determine the microbial transport activities (Newby et al., 2000). Microbial transport is affected by the availability of pore space between soil particles. Size of the microbes should be smaller than micro pores for the filtration to occur. Nutrient availability affects the size of the microbes influencing microbial movement (Newby et al., 2000). Properties of cell surface and microbial adhesion influences microbial transport in the soil particles. pH value of the porous medium matrix solution has impacts on microbial transport (Newby et al., 2000). Viral adsorption and transport has been found to be affected by pH (Newby et al., 2000). Ionic strength or the concentration of cations and anions in solution affects microbial transport. Decrease in ionic strength of the solution facilitates increased bacterial transport (Newby et al., 2000). Availability of cellular appendages such as pili, flagella, or fimbria and hydrological factors such as soil texture, soil structure, porosity, water content, and water movement affects microbial transport (Newby et al., 2000). Pore water velocity and bacterial attachment to grain surface and detachment from grain surface controls the rate and extent of bacterial movement in groundwater (AGU, 2001). American Geophysical Union (2001) Breakthroughs in Field Scale Bacterial Transport, Eos, Transaction, Vol 82(38), pp. 417, 423-425. Ginn, T.R., Wood, B. D., Nelson, R. E., Scheibe, T.D., Murphy, E.M. and Clement, T.P. (2002) Processes in Microbial Transport in the Natural Subsurface, Advances in Water Resources, Vol 25, pp 1017-1042. Groundwater constitutes two thirds of the world’s freshwater resources (Chapman, 1996). According to NGWA (2014), 99% of the usable water comes from groundwater. Groundwater has been extracted for multiple uses however agricultural use accounts for 60% of the total extraction globally (ngwa, 2014). India, China, United States, Pakistan and Iran are the top five extractors of the world (ngwa, 2014). Groundwater can be present in fractures of the hard rock or aquifers. Rock fractures may be caused by folds, faults, moves and expansion and water may run off or infiltrate into the fractures (California Department of Water Resource, n.d.). According to California Department of Water Resources (n.d.), the volume of water present in the fractures ranging from few millimetres to centimetres can be two percent of the rock volume however the depth, location, and interconnection of the fractures affect the water volume. Aquifers can be confined and unconfined. Confined aquifer is groundwater between impermeable layers of rock with less movement of water and replenished by rain or stream water some distance away from the aquifer (Tas.gov, 2014). 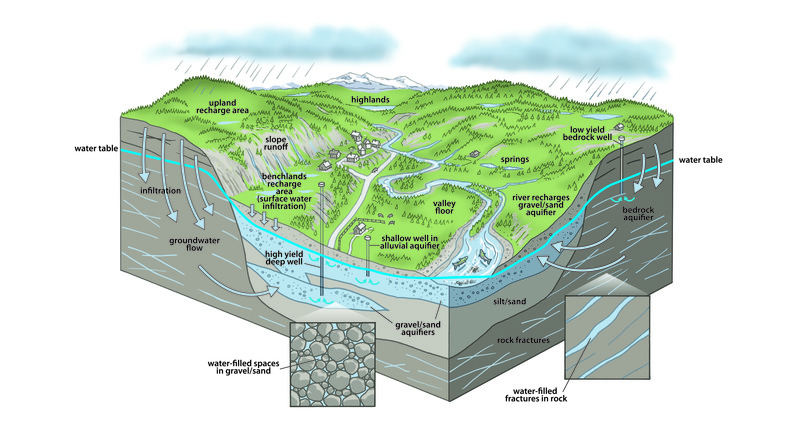 In contrast, unconfined aquifer has direct contact with the atmosphere through the porous soil or rock layer and replenished directly by rain or stream water from the porous layer (Tas.gov, 2014). Gravity causes groundwater to move from the areas of recharge to areas of discharge however porosity, permeability and slope of the underground formation influence groundwater movement (Alberta Environment, 2009). Porosity has been defined as the percentage of the openings or pores in a given volume of the rock which contain water (Chapman, 1996). Highly porous rock surface contains more volume of water however only a portion of water can be extracted. The ratio of the volume of water that can be extracted to the total saturated volume has been defined as specific yield of the material (Chapman, 1996). Alberta Environment (2009) Groundwater Basics [Online] Available at http://www.environment.gov.ab.ca [Accessed on 12 June 2014]. California Department of Water Resources (n.d.) Ground Water in Fractures Hard Rock[Online] Available at http://www.water.ca.gov [Accessed on 12 June 2014]. Chapman, D. (1996) Water Quality Assessment – A Guide to Use of Biota, Sediments and Water in Environmental Monitoring – Second Edition [Online] Available at http://www.who.int [Accessed 15 June 2014]. National Groundwater Association (NGWA)(2014)Groundwater Fact Sheets [Online] Available at http://www.ngwa.org [Accessed on 15 June 2014]. Tasmanian Government (2014) Confined and Unconfined Aquifers [Online] Available at www.tas.gov [Accessed on 5 June 2014]. Heritable changes in the DNA sequence has been defined as DNA mutation. DNA damaging agents such as X-rays, UV-rays or chemical might cause DNA mutation. Natural processes in the cell may result a spontaneous mutation and reaction between mutagen and DNA can cause induced mutation (KSU, n.d.). Hereditary mutations or germline mutation can be passed to next generation from parent to child and it remains in the individual’s body throughout the life however somatic or acquired mutation caused by external factors cannot be passed onto next generation (NIH, 2014). Mutation can be transition or transversion. In transition, purine nucleotide is changed into purine and pyrimidine into pyrimidine whereas purine is changed into pyrimidine and vice versa in transversion mutation (Chuck and Chao, n.d.). Insertion, deletion and substitution are DNA mutation mechanisms. Nitrogenous base is replaced in substitution by other bases, deletion is the loss of the block of one or more DNA pairs and insertion is the addition of the block of one or more DNA (Berkeley, n.d.). Mutation can have health effects on human body. Normal development of body and development of embryo at its early stages can be affected by mutation (NIH, 2014). Mutation can also induce protein malfunction and genetic disorder (NIH, 2014). Deletion occurring between repeated sequences has resulted changes in mitochondrial structure and disorder of central nervous system known as mitochondrial encephalomyopathies (immuneweb, n.d.). Depurination and deanimation can lead to spontaneous lesions causing DNA damage and mutation. Depurination is the interruption of the glycosidic bond between the base and deoxyribose and the subsequent loss of a guanine and an adenine residue from the DNA. Deanimation includes the conversion of G-C pair into an A-T pair (Immuneweb, n.d.). Berkeley (n.d.) Types of Mutations and their impact on protein function [Online] Available at http://www.mcb.berkeley.edu [Accessed on 22 May 2014]. Chuck, G. and Chao, K (n.d.) Mutation [Online] Available at http://www.memocgu.tw [Accessed on 13 May 2014]. Immuneweb (n.d.) Mechanisms of Gene Mutation [Online] Available at http://www.immuneweb.com [Accessed on 25 May 2014]. KSU (n.d.) DNA Mutation [Online] Available at http://www.faculty.csu.edu.sa [Accessed on 22 May 2014]. Marinus, M.G. (n.d.) Mutation [Online] Available at http://www.users.umass.edu [Accessed on 13 May 2014]. Exogenous or external processes and internal metabolic processes of the body contribute thousand to a million DNA damaging events per day (Dexheimer, 2013; Sigma-Aldrich, 2007). Errors, damages and chemical changes of the DNA molecules are identified and corrected in the DNA repair process. DNA repair involves the identification of DNA errors and maintenance of the errors to prevent cell death or remove cancerous cells (Sixth framework programme, 2009). Mismatches of the nitrogenous bases, breaks in the backbone and crosslinks of the covalent linkages between the bases are common types of DNA damage (users.rcn.com, 2013). Direct DNA damage or crosslinking between adjacent cytosine and thymine bases creating pyrimidine dimers is caused by UV-B and indirect damage or free radicals formation is caused by UV-A (University of Leicester, 2010). Processes such as replication or transcription can be affected by DNA damage and mutations can be induced causing cancer (Dexheimer, 2013). UV-radiation, gamma rays, X-rays, oxygen radicals and other chemicals act as agents to damage the DNA molecules (users.rcn.com, 2013). Chemical causing DNA damage includes alkylating agents such as methyl methanesulfonate, temozolomide, nitrogen mustards, chemotherapeutic drugs such as topoisomerase I or II inhibitors and other chemicals such as N-nitrosomines, heterocyclic amines and benzo-a-pyrenre (Dexheimer, 2013). According to University of Leicester (2010), industrial chemicals such as vinyl chloride and hydrogen peroxide, and environmental chemicals such as polycyclic hydrocarbons cause DNA damages. DNA repair mechanisms include base excision repair, mismatch repair, nucleotide excision repair and double strand break repair (Dexheimer, 2013; Sixth framework programme, 2009). Dexheimer, T.S. (2013) DNA Repair Pathways and Mechanisms. Mathews, L.A. (eds)(2013) DNA Repair of Cancer Stem Cells. Springer. [Online] Available at www.springer.com [Accessed on 26 March 2014]. Sixth Framework Programme (2009) DNA Damage Response and Repair Mechanisms [Online] Available at http://www.dna-repair.nl [Accessed on 29 March 2014]. Sigma-Aldrich (2007) DNA Damage and Repair [Online] Available at www.sigmaaldrich.com [Accessed on 20 March 2014]. University of Leicester (2010) DNA Replication and Repair [Online] Available at www2.le.ac.uk [Accessed on 29 March 2014]. Users.rcn.com (2013) DNA Repair [Online] Available at http://www.users.rcn.com [Accessed on 20 March 2014]. DNA is the hereditary material found in humans and other organisms. DNA, found in nucleus of a cell is known as nuclear DNA and found in mitochondria is known as mitochondrial DNA (NIH, 2014). Genes and chromosomes are made up of DNA and human body contains 20,000 to 25,000 genes (NIH, 2014). Building block of DNA is nucleotide. Nucleotide consists of a pentose sugar, a phosphate group and a nitrogenous base (IPGRI and Cornell University, 2003). Nitrogen-containing molecules or nitrogen bases guanine and adenine are called purines and cytosine and thymine are called pyrimidine. DNA has unique double helix structure. DNA model and double helix structure was proposed by James Watson and Francis Crick in 1953. DNA structure has sugar phosphate backbone. Double helix of DNA is formed by base pairs of Adenine-Thymine (AT) and Guanine-Cytosine (GC). Two DNA strands are joined by hydrogen bonds to form double helix structure (Clark, 2013). Glycosidic is the bond between a nitrogenous base and a sugar phosphate molecule and Phosphodiester is the bond between the sugar phosphates. The hydrogen bond joining the two strands of DNA is weaker than glycosidic or phosphodiester bonds. Hydrogen bond can be broken to separate two strands of DNA at higher temperature around 100o C with polymerase chain reaction (PCR) and the process is called denaturation or melting (May, n.d.). Renaturation or annealing is the process of connecting two strands of DNA with hydrogen bond (May, n.d.). DNA can be replicated to produce two genetically identical daughter cells (NIH, 2014). Clark, J. (2013) DNA-Structure [Online] Available at www.chemguide.co.uk [Accessed on 27 January 2014]. May, P (n.d.) DNA: Deoxyribonucleic Acid [Online] Available at www.bris.ac.uk [Accessed on 27 January 2014]. IPGRI and Cornell University (2003) Using Molecular Marker Technology in Studies on Plant Genetic Diversity [Online] Available at www.irc.igd.cornell.edu [Accessed on 12 January 2014]. National Institute of Health (NIH)(2014) Cells and DNA [Online] Available at www.ghr.nlm.nih.gov [Accessed on 12 January 2014]. Biological adaptive capacity of human and coping mechanisms of ecosystems are affected by long term climatological changes. Technology and infrastructure are developed to prepare for projected change based on historical data. Extreme and climatic events can have severe impacts on human health and ecosystem. Robinson (2001 cited in Souch and Grimmond, 2004) defined heat wave as longer period of heat stress causing health and social effects. Increasing trend of global warming has been associated with heat waves. According to NWF (2009), more heat waves will occur as a result of global warming. The rise of global mean temperature by 10C could result in the deaths of 350,000 additional people due to heat related health problems (Tol, 2002 cited in Souch and Grimmond, 2004). In Australia, there was temperature increase of 0.9oC since 1910 and hot days ad heat waves are more frequent than past decades (CSIRO and BOM cited in climatecommission, 2013; climatecommission, 2013). Cities and urban areas have more heat wave events than rural areas and heat islands are more likely to be formed in cities. Heat energy absorbed from the sun during the day is trapped in urban surfaces and buildings resulting slower loss of heat and transportation and commercial sector energy usage increases heat effects in cities (DOH, 2011). Heat wave causes a number of health impacts. Very young and old people and patients with chronic and severe illness are more likely to suffer from heat waves (DOH, 2011; NWF, 2009). Heat cramps, heat rash, heat oedema, heat syncope, heat exhaustion and heat stroke are possible heat related illnesses (DOH, 2009). Various indices have been developed to measure heat waves based on its impacts on human health. Effective temperature and discomfort index was suggested by McGregor et. al. (2002 cited in Souch and Grimmond, 2004), summer index was developed by Watts and Kalkstein (2004 cited in Souch and Grimmond, 2004), heat wave duration index (HWDI) was described by Frich et. al. (2002 cited in Souch and Grimmond, 2004) and physiological thermal index (PET) was proposed by Matzarakis et. al. (1999 cited in Souch and Grimmond, 2004). CSIRO (Commonwealth Scientific and Industrial Research Organisation) and BoM. (2007). Climate Change in Australia –Technical Report. Cited in Climatecommission (2013) Off the charts: Extreme Australian Summer Heat [Online] Available at http://climatecommission.gov.au [Accessed on 27 May 2013]. Climatecommission (2013) Off the charts: Extreme Australian Summer Heat [Online] Available at http://climatecommission.gov.au [Accessed on 27 May 2013]. Department of Health (DOH) (2009) Protecting Health and Reducing Harm from Extreme Heat and Heat waves. [Online] Available at https://www.gov.uk/ [Accessed on 27 May 2013]. Frich, P., Alexander, L.V., Della-Marta, P., Gleason, B., Haylock, M., Tank, A.M.G.K. and Peterson, T. 2002: Observed coherent changes in climatic extremes during the second half of the twentieth century. Climate Research 19, 193–212. Cited in Souch, C. and Grimmond, C.S.B. (2004) Applied Climatology: ‘Heat Waves’. Progress in Physical Geography. 28(4) pp. 599-606. Matzarakis, A., Mayer, H. and Iziomon, M.G. 1999: Applications of a universal thermal index: physiological equivalent temperature. International Journal of Biometeorology 43, 76–84. Cited in Souch, C. and Grimmond, C.S.B. (2004) Applied Climatology: ‘Heat Waves’. Progress in Physical Geography. 28(4) pp. 599-606. McGregor, G.R., Markou, M.T., Bartzokas, A. and Katsoulis, B.D. 2002: An evaluation of the nature and timing of summer human thermal discomfort in Athens, Greece. Climate Research 20, 83–94. Cited in Souch, C. and Grimmond, C.S.B. (2004) Applied Climatology: ‘Heat Waves’. Progress in Physical Geography. 28(4) pp. 599-606. National Wildlife Federation (NWF) (2009) More Extreme Heat Waves: Global Warming’s Wake Up Call. [Online] Available at http://www.psr.org/assets/pdfs/more-extreme-heat-waves.pdf [Accessed on 27 May 2013]. Robinson, P.J. 2001: On the definition of heat waves. Journal of Applied Meteorology 40, 762–75. Cited in Souch, C. and Grimmond, C.S.B. (2004) Applied Climatology: ‘Heat Waves’. Progress in Physical Geography. 28(4) pp. 599-606. Tol, R.S. 2002: Estimates of the damage cost of climate change. Part I: benchmark estimates. Environmental and Resource Economics 21, 42–73. Cited in Souch, C. and Grimmond, C.S.B. (2004) Applied Climatology: ‘Heat Waves’. Progress in Physical Geography. 28(4) pp. 599-606. Watts, J.D. and Kalkstein, L.S. 2004: The development of a warm-weather relative stress index for environmental applications. Journal of Applied Meteorology 43, 503–13. Cited in Souch, C. and Grimmond, C.S.B. (2004) Applied Climatology: ‘Heat Waves’. Progress in Physical Geography. 28(4) pp. 599-606.